What does God say to Moses about what to expect from Pharaoh? What prophecy about his son is Moses directed to deliver to Pharaoh? Did the people question the message from Moses and Aaron? What did they do when they heard that God was concerned for them? NOTE: Verses 24-26 relates briefly God’s threatening the life of Moses, because he has not circumcised his son, i.e., he has not had him marked with the sign of the covenant. This may have been a lesson to remind Moses that it is God’s wrath which is to be feared, not Pharaoh and that God’s ordinances are to be taken seriously (cf. Gen. 17:14). It is also a sign that God has provided the means by which to turn aside this wrath, involving blood and the sign of the covenant…elements which are to be repeated in the Passover that culminates in the deliverance of Israel from Egypt. In whose name does Moses make his request of Pharaoh? 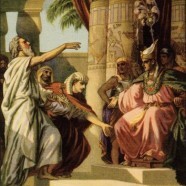 What is Pharaoh’s reaction to Moses? What does Pharaoh say about his relationship to the LORD? What command does Pharaoh give Moses and Aaron? What command does he give to the taskmasters and the foreman? What does Pharaoh say is the real reason why Israel wished to go into the wilderness to worship the LORD? What change has Moses brought about tor the people of Israel? Are they grateful? What does Moses say to God?